In a survival situation, timing is everything. The extra couple seconds it takes you to reach something in your pack can very literally mean the difference between life and death – especially if that item is needed for first aid or self-defense. Having both hands available at all times can be a huge advantage, and a great way to ensure you can maneuver hands-free is by wearing a headlamp. In survival situations, headlamps (or headtorches, depending on where you hail from) are extremely convenient and useful, as well as having a variety of applications outside of survival situations including outdoor / camping adventures and home projects. However, there isn’t a one-size-fits-all approach, different circumstances will require headlamps of a certain quality. While you may not be concerned with the quality of headlamp you’re using to complete repairs in your garage, you’ll definitely want to ensure the one in your bug-out-bag is the best headtorch for your needs. The primary function of a headlamp – whether it be for camping, home use, or survival – is hands-free illumination. There are a variety of add-ons that come with certain models, but generally, an LED headlamp is not considered a multi-use item. Why use a headlamp? Consider the various situations you may find yourself in and how hands-free illumination could make those situations substantially easier. If you’ve ever tried to set up camp in the dark or quickly reach supplies in your pack, you know the value of having both hands free. If you find yourself in a power outage, a great hiking headlamp will allow you to navigate a dark basement and check the breaker or make repairs quickly and easily with both hands at your disposal. Be sure to have the best LED headlamp when navigating tight spaces. Photo by darkday. In a survival situation, LED headlamps can also function as excellent signalling devices – particularly those with either a strobe or SOS setting – and are less likely to be dropped or lost as they are strapped to your head. Additionally, the use of LEDs has led to brighter lighting and longer lasting battery life, meaning that most of the best headtorches can be used for several hours a day for well over a month before their battery power runs out. So what qualities should you look for when searching for the best headtorch? Your priorities may differ depending on whether you are looking for the best hiking headlamp, best camping headlamp, or best LED headlamp; and ultimately, how you intend to use your headlamp. Generally, when choosing the best headtorch, you will want to look for the following: brightness, distance and battery life; comfort, weight, and size; and IP rating for water resistance, IK ratings for shock resistance, and durability. How Powerful Should Your Headlamp Be? The brightness of your LED headlamp will determine how far you will be able to see, and how far you need to see is determined by the specific activities you intend to use your headlamp for and your climate. In some cases, a headlamp with exceptionally long range may not be necessary if the tasks you will be performing are close at hand, such as reading and repairs. However, if you intend to use your LED headtorch for tasks such as scavenging for supplies or monitoring your perimeter for security, you will definitely want a headlamp capable of scanning long distances. Additionally, the climate you live in can play a role in the brightness required from your headlamp as light travels furthest in dry air; therefore, an arid climate would require less light than a humid one. The best hiking headlamp or best camping headlamp for outdoor use does not necessarily need to be brighter than 100 Lumens. To ensure you have an available option for almost any visibility scenario, select a headlamp with a combination of floodlight and spotlight settings. A floodlight can light up an entire campsite while the focused beam of a spotlight can pinpoint a distant object. Additionally, strobes can be very useful for signaling as well as running in the night, while an SOS signal can be vital in a survival situation. In a survival situation, preserving battery power will be essential, as will having more than one battery option. Many survivalists opt for headlamps with both white and red LEDs to maximize battery life. The red light setting can be used for low-light tasks such as reading, as this setting is both easier on the batteries and eyes. Brighter lights will run your batteries down faster, so if finding a power source will be an issue, you may want to cut back on the Lumens or numbers of LEDs in your headlamp. Cooking at night is made easier with a camping headlamp. Red LEDs provide enough light for grilling dinner and won’t drain the batteries. Photo by Jim Sher. Much like your bug-out-bag, for your best headtorch choice, you want to select one that is both comfortable and lightweight, especially if you will be traveling frequently at night. If you plan on wearing your headlamp for extended periods or while you are running or climbing, a top strap can be a desirable option as this adds stability. Whether or not you choose to wear a top strap, make sure to adjust the band so that it fits snugly enough to keep the light in place while you shake your head. To eliminate neck strain, choose a headlamp with an adjustable light angle. Both the number of lights and type of battery will affect the weight of your headlamp. Make sure that the model you choose is the best headtorch for your needs and of a weight that you can reasonably support for an extended period of time. The more LEDs, the brighter your light – but with each additional LED you are adding to the overall size and weight of your headlamp and increasing the draw on your batteries. Depending on your needs, decide what the ideal size and number of LEDs is that you can reasonably support without the headlamp being too heavy or depleting the batteries too quickly. Does It Stand Up To The Elements? The IP rating refers to Ingress Protection Marking or International Protection Marking. It rates the protection of mechanical and electrical parts against solid particles and liquids. If there is an ‘X,’ this signifies that there is no rating available for this criteria, as in the case of IPX4 where the ‘X’ indicates the item is not dust rated and has a water resistance of 4 (meaning it can withstand splashing but not submersion). The best hiking headlamp should be able to withstand rain and occasional dunks. Photo by Jussarian. The IK rating refers to mechanical impact and measures how many joules of downward force the object can endure. For the majority of consumer products, shock resistance ratings are typically given in meters, indicating the height at which the item can be dropped from and still withstand the impact. For durability, choose an LED headlamp that has fantastic impact resistance, especially for use in survival scenarios. A reliable, quality headlamp not only makes an excellent addition to your survival gear, but also to your general equipment for outdoor activities and daily tasks. The benefits of having a dedicated light source that stays put while you are hiking, running, or climbing, are endless; as are the benefits of being able to work freely with both hands while maintaining constant illumination. When choosing the best LED headlamp for your needs, make sure to select one that provides an adequate level of lighting in a model that fits you comfortably. Look for headtorches that have multiple light settings and angle adjustability, as these qualities will increase the versatility and usefulness of your headlamp. Additional considerations, especially for outdoor use, are the levels of water and shock resistance and having more than one battery option available. Always remember, chance favors the well-prepared – and especially the well-equipped! Do you own a headlamp? Would you choose a headlamp as your primary light source for your bug-out-bag? What benefits or drawbacks do you feel are most significant? Share your thoughts in the Comments Section below, thanks! In this review article, I’ll give you the rundown on a trio of tools from Nitecore including the general-use EA21 flashlight and the EDC-focused MT06 flashlight and NTP10 Titanium Pen. I’ve had these tools for several weeks now, and have had plenty of opportunities to put them through their paces. The MT06 EDC light and NTP10 tactical pen have been riding with me daily as part of my EDC gear. Meanwhile, the EA21 has served me well on home duty and on a few camping trips. Read on to see how I tested them and what I thought! All the output options you could ask for: 5 brightness settings ranging between 1 and 360 lumens plus Strobe, Beacon, and SOS modes. Handy 5” x 1” size makes for easy storage in a bag, cargo pocket, or glove box. Drop-proof LED for those all-too-common impacts. Built to withstand dunking in a deep creek with IPX-8 water submersion resistance. Light, sub-4oz weight including 2x AA batteries. Multi-position metal clip to suit every carry option. Includes a carry pouch, spare o-rings for backups or maintenance, and a lanyard attachment option. Nitecore Review: EA21 Flashlight comes with multi-position clip, lanyard, spare o-rings, and carry pouch that clips easily to a belt or MOLLE webbing. So Many Options . . .
I’m not ashamed to admit that after pulling this light out of the box I had to look over the instruction booklet to figure out how to use all its modes. After getting used to it, I’ve found I really like the functionality of the unique dual button setup, which became intuitive after a short learning curve. I can easily go into Turbo mode (a blinding 360 lumens) or Ultra-low mode (1 lumen) or just turn the unit on and off without cycling through all the other brightness and strobe settings. If you need them, however, these emergency modes are quickly accessible. The buttons also provide a nifty locking function that keeps the light from being accidentally turned on when it’s packed in your bag. A neat function that I haven’t seen often is the inclusion of a battery power indicator. A simple battery uninstall/reinstall procedure will key a secondary red LED light to let you know how much life the installed batteries have left. On that note, the EA21 has got enough smarts programmed in it to automatically adjust brightness after twenty minutes on the high setting to keep from killing the batteries or overheating. As an aside, that red LED is also available as a secondary illumination option for low light needs such as map reading and other situations where you want to preserve your night vision. Nitecore Review: Compact EA21 flashlight fits well in a pack or cargo pocket. Dual button control is very useful once you get the hang of it. In my real world use of the EA21 I got to search around for my breaker panel after a power surge at my home. A week or so later I had some furry night creature digging around in my campsite. When the little critter got close to blindness after I shined the full Turbo setting on him, he went scurrying on his way. I was able to follow him with the light while he ran across a field and disappeared into some trees a hundred or so yards away. One thing to note is that as with most intensely bright LED lights, the EA21 gets pretty hot after about ten minutes on the high output setting. I’d be hesitant to stick it right back into a pack or touch the business end of it with my bare hand after extended use. It’s also a little big to be carried in a jeans pocket. I would say that the Nitecore EA21 is best suited to keep in a pack, vehicle, black out kit, or medium to large sized EDC bag. Nitecore Review: The EA21 has a multi-position metal clip for several different carrying options. The Nitecore EA21 is a great general purpose flashlight with some useful extra features for those who demand more than a basic light. The handy size, battery familiarity (who doesn’t have extra AAs? ), and plentiful modes allow for excellent usability in lots of settings. The extremely bright Turbo mode can certainly disorient would-be attackers, while the Ultra-low mode can be used without giving away your position in sensitive settings. As an addition to a BOB (in the locked-off setting, of course), on car trips, or as an at-home night security tool, the EA21 is great choice (CLICK HERE to see the EA21 on Amazon). Built from CNC milled titanium, the body of this pen is indestructible. Designed as a standard-sized pen at 4.25”, but a crazy light 18 grams. Equipped with a Fisher Space Pen cartridge for smooth writing anywhere. The cutout body makes for a superior positive grip during writing or defense use. Extra strong replaceable tungsten tip for busting windows or bad guys. Included storage/gift case to keep a low profile or impress friends. Nitecore Review: The NTP10 has a lightweight yet indestructible titanium body. In the month that I’ve been carrying around this titanium pen I’ve used it to write notes, sign forms, and punch massive dents in seasoned old pallet wood (no bad guys could be found to test the tungsten tip out). Nitecore Review: Testing the NTP10 on an unsuspecting pallet. Flat top design works well for applying force. I’ve also received several compliments on it; the NTP10 looks really cool with its spiral cut styling and matte titanium finish. Besides looking good, those spiral cutouts provide excellent grip for the occasional smashing the pen is designed to endure. Nitecore Review: Spiral cut of the NTP10 Tactical Pen adds grip and style points. In use, the NTP10 is smooth and functional. The Fisher Space Pen ink cartridge works every bit as well in your exciting cubicle as it does in the dull confines of outer space for which it was designed. The pen itself is quite comfortable in the hand whether in writing mode or held ready for battle. Nitecore Review: NTP10’s Fisher Space Pen cartridge is pressurized for smooth writing, even when upside down. The NTP10 is as functional as it is cool. The only drawback I found during my evaluation was regarding its super sharp window-breaking carbide tip. It’s a dead giveaway to airport security screeners; getting onto a plane with this pen might be a difficult proposition. That same tip can also damage pants pockets or cloth bags if not properly secured. Nitecore Review: NTP10 Tactical Pen has a sharp Tungsten tip for breaching and combat. I’d suggest keeping it clipped into a jacket pocket or proper pen slot in a bag. Alternatively it can be stored in its included aluminum case; though that significantly reduces its readiness factor. Also, it’s a nice size (about the size of a standard Bic pen), but might be a bit small for those with very large hands or while wearing gloves. In short, the NTP10 is a really cool, unique, and functional piece. If you’re looking for a unique daily carry item with multiple uses, this titanium tactical pen should be an intriguing option. For more information on the NTP10 you can CLICK HERE to check it out on Amazon. Two simple no-hassle brightness settings: 165 lumens and 32 lumens. Extremely light at just 1.58 oz. with AAA batteries. The 5” x 0.5” size is perfect for clipping into a pocket or small EDC bag. Powerful 92m max beam distance for those long shots. Proprietary LED is resistant to impacts from waist-high drops onto pavement. Water won’t be a concern due to an IPX-8 water submersible rating. Nitecore Review: The MT06 is built tough from aerospace grade aluminum alloy. One of the big advantages of the MT06 in my view is that it doesn’t have that suspicious tactical look to it. There’s no “skull smasher” crown and no crazy knurling. This light is designed to be carried anywhere with a low profile and simply meet a utilitarian need for a dependable quality light. A bit thicker than an average pen, the size is just right for clipping into a pocket or EDC pouch. Its standard rear-mounted button makes for easy on/off toggling with one hand. The two light modes come in pretty handy. Navigating through a dark car lot at night I was thankful to have the 165 lumen high mode. Then when I had to search around for the keys that my sweaty hands had just dropped between the seat and the console, the low 32 lumen setting was bright enough without causing a blinding reflection. Nitecore Review: MT06 Flashlight delivers high quality light with a low profile for every day carry. Like the EA21, if you leave this light on high mode for too long it will switch to the lower setting automatically to maximize battery life and minimize heat. High mode can be easily reactivated by clicking it back on. While it’s refreshing to have a good EDC light that doesn’t look like it belongs mounted on a SWAT weapon, Nitecore might also have done well to incorporate some form of EA21-style lock setting on the MT06. With the easy-to-tap rear button there’s a small chance of the light being turned on if it’s left to bounce around in a bag. Otherwise, this little light is an awesome companion to the rest of your EDC gear. The MT06 packs convenience, performance, and easy utility into a modestly priced (see the best price for the MT06 HERE on Amazon) flashlight. Really, all three of the tools in our Nitecore review were useful and practical. The two lights are incredibly efficient; just a few years ago flashlights like these would have cost a fortune. All 3 of the Nitecore reviewed products are compact and durable. Nitecore has been around since 2004 and is a well-respected brand in EDC and preparedness circles. A member of Portable Lights American Trade Organization (PLATO), each of Nitecore’s offerings are independently tested and rated (For the unaware, PLATO is the organization responsible for the handy lumen/runtime/beam properties charts on the packaging of all those fancy flashlights you’re always playing with at REI.). Since their introduction, Nitecore lights have gained favor with outdoor enthusiasts, members of the military, and others looking for high quality handheld lighting solutions. Have you used the EA21, NTP10, or MT06? Do you have another Nitecore flashlight that you like? Want to see another Nitecore flashlight review? Let us know in the Comments Section below, thanks! Emergencies can happen in any place at any time, and it’s always better to be prepared in case the unexpected happens. The last thing you want is to be left out in the dark. Finding the best survival flashlight for your bug out bag is an important part of assembling your kit. There are a lot of options out there, and it can be difficult to find a good flashlight among all the noise. In this guide, I will step you through the process of finding the best survival flashlight by looking at features, size, weight, battery type, and materials. To save you time sorting through the huge variety of options out there I have made some recommendations to help you narrow down the best survival flashlights on the market. The Vizeri LED Flashlight is a fantastic choice for a bug out bag flashlight. It is a compact powerhouse that will not take up much room in your BOB, coming in at 4.25″ long and weighing less than 4 ounces. This hand sized light still manages to pump out 230 lumens, more than enough to blind an attacker, light up a large area, or scare off an aggressive animal. Additionally, it can take either AAA alkaline or 18650 Li-ion batteries to give you flexibility when trying to scavenge replacements in the field. The Vizeri LED Flashlight proves its versatility again with its 5 output modes (high, mid, low, SOS, strobe), giving you the ability to signal for help, blast out a blazing light, or conserve energy. On top of all this, the Vizeri LED Flashlight is weatherproof rated up to IPX-7, giving you confidence that it will illuminate your path in all conditions. The features listed above are typically found in lights that are in the $150-200 range. The Vizeri LED Flashlight provides all this at a fraction of that. Overall, a great survival flashlight at an amazing price. The SureFire E2D Defender is an ideal self-defense flashlight that excels in both of its required tasks. First off, the SureFire E2D Defender is a dual mode flashlight that can shine at a blazing 200 lumens for tactical situations or be toggled down to 5 lumens for discrete or energy efficient applications. The flashlight will shine for 1.9 continuous hours while in high mode and an astounding 76 hours in low mode. The SureFire E2D Defender has also been smartly designed with a lock mode in the on its switch to prevent accidental activation while on the trail to keep your batteries saved for when you need them. As for the self-defense potential of the SureFire E2D Defender, it has been thoughtfully crafted with your protection in mind. The crenelated front bezel and scalloped tail are designed to intimidate on sight and magnify the force of a strike. There is no doubt that a blow from the SureFire E2D Defender will stop an aggressor in their tracks, whether animal or human. Overall the SureFire E2D Defender is a fantastic multipurpose tool, providing outstanding illumination and effective self-defense options to any bug out bag or EDC kit. If you are looking for a full-size light for your BOB, the Coast HP17TAC Flashlight is an outstanding choice. First off, it is extremely bright, pumping out a blinding 615 lumens in high mode and a respectable 64 in low. The Coast Flashlight will effectively throw its beam a whopping 882 feet, just shy of 3 football fields. The Coast Flashlight’s larger size allows for it to carry a larger battery supply. This translates into the best lifetime of any of the flashlights that we looked at. It will operate at its high setting for over 15 hours and coast along on low for more than 51 hours. The other advantage of the larger size of this flashlight is that it can easily double as a blunt self-defense weapon. Measuring just over 13″ and weighing 1lb, you can swing this with confidence if your back is up against a wall. The Coast HP17TAC Flashlight is powered by 3 D size alkaline batteries which make scavenging for replacements a relatively easy proposition in any populated area. This is a great flashlight that is built well enough to light your way for years to come. One problem that many people have when trying to figure out what to put in their bug out bag is dealing with the weight and volume constraints of their backpack. Even small bags can get extremely heavy when they’re filled with survival gear. 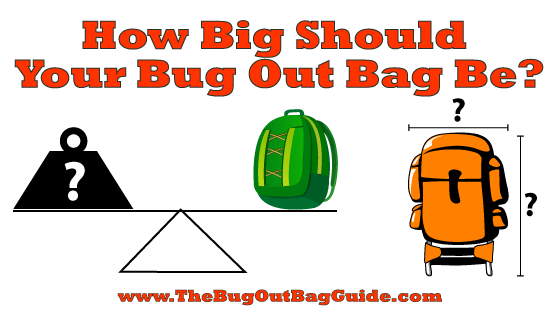 Large bug out bags that become overly heavy can be far too difficult to carry and may even rip due to the weight. To estimate the weight of your BOB, try our free bug out bag tool here. Ideally, a bug out bag flashlight will weigh 16 ounces (1 lb) or less when fully loaded with batteries. Another issue that is especially prominent in small bug out bags is the issue of space. A bug out bag is not very useful if a few large items are eating up all of the space. The key to dealing with this isn’t putting in fewer items, it’s finding smaller items that work just as well. Many people choose to buy small flashlights that fit easily in the palm of your hand such as mini-flashlights and keychain flashlights to have lightweight and effective lights that take up little space. If you have plenty of room to spare, a rugged tactical flashlight can be a good choice. While being heavy is a benefit for flashlights that double as billy clubs, it’s best to avoid a bulky survival flashlight if you do not intend to use if for this purpose. Look for a light that is 8 inches or less in length to keep your BOB uncluttered, this should suit most survival needs. If, however, you are looking for a flashlight that can double as a self-defense item you may want a larger model, as mentioned above. When you use a flashlight as your everyday carry (EDC) flashlight, the type of battery you choose comes down to your own requirements and how you plan to use the flashlight (see the article on choosing the best EDC flashlight for your needs here). However, a flashlight that you plan to keep as part of your bug out bag will have a different set of requirements to consider when it comes to batteries. An EDC flashlight, for example, is going to be used often and probably for relatively short periods of time, whereas a survival flashlight for your bug out bug will only be used in case of an emergency situation. In such a scenario, chances are that there will not be power available and you will need to use your flashlight for long periods of time. For this reason, alkaline batteries (AA, C, or D sized) would be the battery option I would recommend. And here is why – alkaline batteries are generally much more commonly available than high-end battery types such Li-ion batteries, while still providing enough power to your flashlight for an extended period of time. When your battery power runs out, you can simply replace the batteries with new ones you have with you or that have been scavenged and carry on. Alkaline batteries are not perfect, though. You need to keep in mind that alkaline batteries can lose power over an extended period of time and could leak battery acid when left in your survival flashlight for a long period of time, ruining your light. So if you do go the alkaline battery route, check the batteries regularly for corrosion or leakage. If you spot leakage, replace the batteries as soon as possible! When it comes to flashlights, you can’t get much better than LED bulbs. They’re brighter, clearer, last longer, are more energy efficient and far more durable than traditional incandescent light bulbs. All these factors make LEDs a great choice for many uses including survival flashlights. LED bulbs are also a favorite for tactical flashlights as their intense brightness is good for blinding enemies. When it comes to buying a flashlight for your bug out bag, brighter is almost always better. Visibility is vital when it comes to survival situations. About 45 to 150 lumen is the preferred amount for many survival flashlights, but be warned that increased brightness means more strain on the batteries. Note that if you are looking for a self-defense flashlight, a minimum of 100 lumens is needed for blinding aggressors. Having a focused beam and a good reflector are also necessary for getting the most out of your light. Bigger bulbs and wider reflectors allow a larger area to be illuminated, which is good for lighting up eating areas, car interiors or small rooms. However, when the beam is wider the light doesn’t reach as far. Focused beams with narrow reflectors don’t illuminate as much, but the light extends much farther. Having an adjustable beam will allow you to have the best of both worlds, look for this feature when finding the best survival flashlight for your bug out bag. It’s always a good idea to ensure that the flashlight will stand up to water, cold and hot weather, mud, ice and other adverse weather conditions as natural disasters are a common reason to need a bug out bag. Weatherproof flashlights are especially beneficial to hunters, hikers and anyone who plans on using their BOB for wilderness use. Weatherproofing is typically expressed as an IPX rating from 1 to 8. Look for a flashlight that is advertised as rated IPX-4 for basic water resistance and IPX-7 or 8 for a survival flashlight that can be submerged without damage. Anodized aluminum is a favorite of tactical flashlight users, but is it as useful for your bug out bag flashlight? Most metal flashlights are sturdy, but some plastics can also be very strong and stand up well to various forms of damage. Metal conducts both cold, heat, and electricity while plastic doesn’t get very cold or hot in intense temperatures. Metal can be quite heavy while plastic is fairly light. If you’re merely using the flashlight for illumination, plastic may be a better choice. If you have the ability to use it as a self-defense flashlight, anodized aluminum will be a better choice. There are many survival flashlights that can be used as a billy club or kubotan as a means of self-defense against animals or other people. If you already have a reliable weapon such as a firearm, pepper spray, machete or EDC knife, you may not need a self-defense flashlight that acts in this way. However, they’re still good to have as you can never have too many means of protection. Additional features can be useful when finding the best survival flashlight to meet your particular needs. For example, some flashlights have alternating colors for signaling, night-vision, tracking blood and more. Multiple brightness settings can be useful for saving battery life or when you want to avoid drawing attention to yourself. Brighter beam settings can are useful for signaling and potentially blinding enemies. Clips for belts, lanyards, hats and more are great for convenience purposes. Having a headlamp or a hat clip for a flashlight can also allow for hands-free use in emergencies. When looking at extra features for your survival flashlight make sure to find elements that are well suited to your individual needs. This will help you effectively find the best survival flashlight to help YOU survive. When looking for a survival flashlight for your bug out bag, the one that is the best choice is determined by the ultimate purpose of the light and the main application of your bug out bag. The most critical factors to keep in mind are quality, brightness, battery life, and durability. No matter if it’s a small light for a bug out bag that you keep in your car or a large tactical flashlight for a large bug out bag meant for longer term survival situations and outdoor use, those four factors should be the most important aspects to keep in mind for any bug out bag survival flashlight. This article was written by John Bee, who is the author of The Flashlight Guide.